Within weeks after the EPSON blogger’s event, I received the MG-850HD projector for review. And this might well be the first projector you would buy for your home. 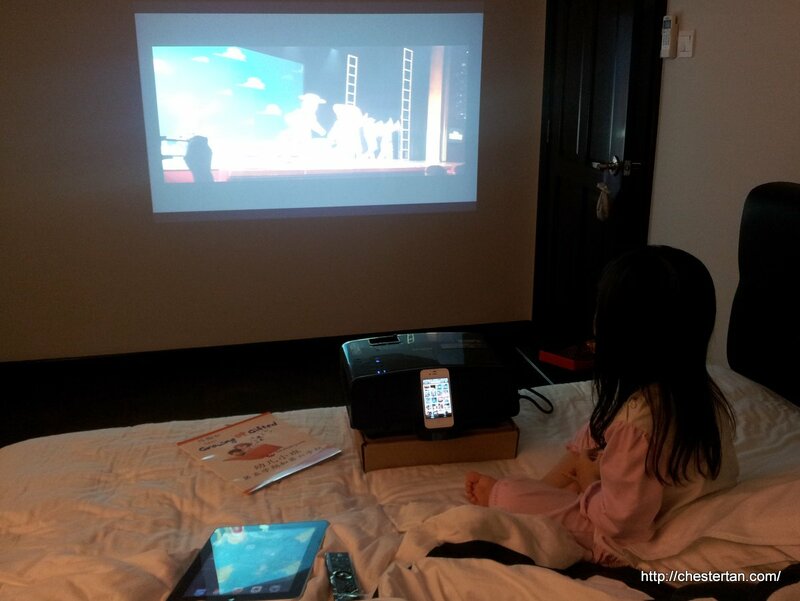 Plug your Apple product – iPhone, iPad, iPod – onto this projector and do presentations, browse photos and watch videos! It has 2x10W speakers that pumps out decent sound for a projector. It can do keystone adjustment up to 30-degrees in all directions, so it means you can project on the screen at an angle and the output will still look in proportion. It has a light ambient sensor that also auto white balance, so you get both colour and brightness compensation. It runs on 3LCD technology which promises more faithful colour reproduction and no colour break-up (also known as “rainbow effect”). It supports multiple connectors like VGA, HDMI, Component video, Mic-In, even USB port for multimedia slideshow display. It has a built-in handle for easy of carry. It weights 3.9kg, the fan runs at only 35dB. It starts up at just 6 seconds. And this world’s first HD projector for Apple mobile devices retails at just S$1299. The projector is carefully designed with a clean outlook. The speakers at the back of the projector is slanted with speaker grooves. The usual AV connectors are all hidden behind removable casings, so if you were to use the projector exclusively as a standalone dock without any external device connections, the projector would look presentable. There is also a spring handle for you to transport the projector. It might seem redundant – who would carry a projector around without a bag – but the handle would be useful if you move the projector around the house. The moment I slid out the iPhone Dock and inserted the iPhone, the projector displays a multimedia menu to let you navigate, using the projector’s remote, into various folders of music and videos that are stored in your iPhone. When you choose the “Photos + More” option, iPhone apps that support display-out will be projected through the MG-850HD. It is possible to use the projector’s remote to control the playback. iPods and iPads are also supported. Due to iOS limitations on the type of apps that can be displayed on external devices, this dock might not seem as useful. The projector’s 10W stereo speakers sound adequately loud but certainly does not offer audiophile quality. In fact, the audio experience is marred by the unpleasant noise-reduction audio engine, which cuts off very soft passages like classical music. If you play pop music or movies, it should sound fine. Also, you can playback your iPhone songs without turning on the projector lamp, thereby saving electricity and heat generated from the machine. Putting the iPhone dock capability aside, the projector performs well, though it might not be the choice of home theatre buffs because the native resolution is only 1280×800. Colours appear accurate with the 3LCD technology. Inside the menu, you can finetune the image brightness, contrast, tint, sharpness, colour tone. There are preset Colour Modes, Sound Modes to help you get the desired effects quickly. Keystone adjustment lets me project at an angle with no image distortion! The EPSON MG-850HD is a multi-purpose high quality projector that offers many connectivity options. With the iPhone dock option, you might be able to convince your spouse to get one for your home. Instead of a permanent mount, you could set this up on an ad-hoc basis, like what I did during my review. When not using as a projector, you can use it like a normal iPhone dock to pump out your favourite hit tunes.